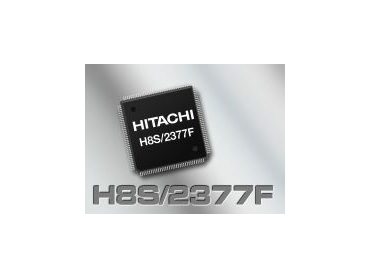 HITACHI, represented by Braemac , has announced the its new H8S/2377F 16-bit embedded Flash microcontroller. Featuring a high integration of peripherals and on-chip memories, the H8S/2377F can lower the system cost of highly-functional systems, shorten development time and enable faster, lower-power, more compact, more reliable and quicker assembly of sophisticated systems. The device has been developed for the EPOS (electronic point of sales) market and is suited to many other consumer and industrial applications such as plasma displays, factory automation and security systems. Key features include nine highly functional timers, three DMA or DMA-like functions, five serial ports, a 16-channel, 10-bit ADC, a six-channel, 8-bit DAC, and up to 113 I/O lines. It also offers On-Chip-Debug (OCD) support, which together with the embedded Flash memory facilitates convenient, low cost and quick debugging using the same device that is used in production. The H8S/2377RF version of the microcontroller also includes an SDRAM interface, which is an unusual feature for a 16-bit device. The H8S/2377F operates at 3.3V/33MHz and delivers approximately 15 MIPS Dhrystone at that speed, enough to quickly calculate RSA encryption algorithms. It typically consumes only 80mA and has several low power modes to reduce this consumption further where possible. The device has 384kB of embedded, full speed Flash memory and 24kB RAM. There is also a low-cost mask ROM version offering 256kB ROM and 16kB RAM, which is suitable to implement STIP (Small Terminal Interoperability Platform) with JEFF, standards used frequently in EPOS terminals. The five serial ports on the H8S/2377F support async, sync, multimaster, IrDA, I2C and a subset of ISO7816-3 smartcard interfaces. The high number of serial ports, which all support ISO7816-3, is useful for EPOS systems, which often have to connect to up to four SAM (Secure Application Modules), one per card issuer. Other peripherals on the device include a 6-channel, 16-bit timer module with up to 16 input capture or output compare units, a 2-channel 8-bit timer module and a watchdog timer. It has one standard DMA, one specialised for very fast external bus transfers and a third slightly slower but very versatile Data Transfer Controller (DTC) that can serve most peripherals. The device also has a Programmable Pulse Generator module (PPG), that can drive a stream of digital data patterns onto up to 16 pins under timer control, thus avoiding the jitter that would be associated with interrupt services. This is useful to drive stepper motors (for example, in motorised card readers or bank note dispensers), but can also be used to drive LCD modules without the need for an additional external LCD timing controller.